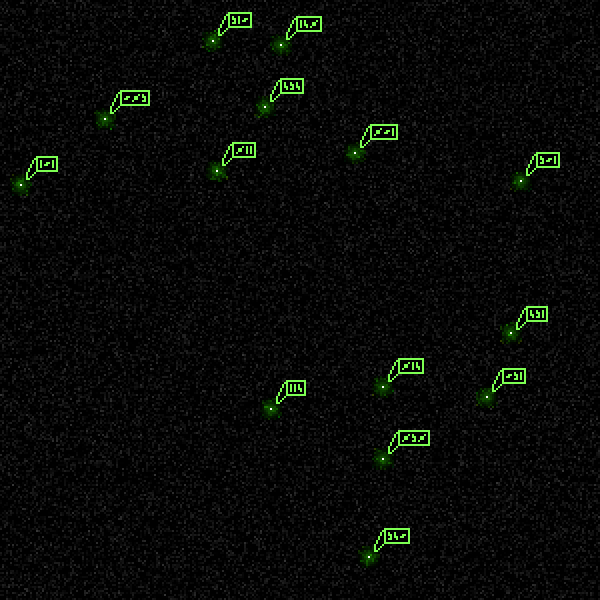 A zoomed-in portion of SCP-XXXX's interface. Special Containment Procedures: All SCP-XXXX instances are kept on their respective planets, with . Until the nature of SCP-XXXX's construction can be ascertained, civilian development of interstellar travel is to be suppressed. Testing has been suspended indefinitely. Description: SCP-XXXX is a 5-meter tall cylindrical device designed for teleporting a user. Externally, the device is composed mainly of translucent green plastic, with its circuitry at the base completely visible. The interior of SCP-XXXX contains a keypad and a screen. Displayed on the screen is an advanced diagram of a large system of galaxy groups, presumed to be an unidentified supercluster. Several points are highlighted in this diagram, designated with separate numbers, and can be zoomed in on individually. The keypad contains 9 glyphs and a single unmarked button. Upon entering a sequence of three glyphs and pressing the unmarked button, SCP-XXXX transports the user to the location (as designated on its interface), into a separate, identical instance of SCP-XXXX. Each instance of SCP-XXXX is located on a separate planet. Notably, each of these planets are capable of sustaining life; despite this, nearly all planets are entirely devoid of life. SCP-XXXX was discovered during interactions with an anomaly capable of interstellar travel. Upon its discovery, Foundation agents noted it along with several other anomalous objects used for scientific purposes. After its initial discovery, tests were soon scheduled; these tests have been logged below. Details: P-101 is an ocean planet slightly smaller than Earth, with few land formations appearing over its surface. P-101 is the first planet that was discovered using SCP-XXXX. Its respective SCP-XXXX instance is located on an island in an archipelago, with each island containing separate research facilities. The previous inhabitants of P-101 were an intelligent aquatic species, dwelling in large underwater complexes. Records suggest an anomalous toxic compound previously engineered for defense was leaked into the seawater of P-101, spreading to the entire planet's oceans in 10 hours and eventually causing the deaths of 93% of the planet's population. The remaining inhabitants evacuated using SCP-XXXX to P-413. Details: P-413 is a planet twice as large as Earth, fulfilling the criteria of a superhabitable planet. P-413 was accessed by Foundation personnel following the discovery of (then outdated) evidence from P-101 that extant life remained on P-413. The SCP-XXXX instance located on P-413 led to an interplanetary political building, with symbols composed of various foods present at a dining table and several P-413 inhabitants dead. Research into events determined that a probabilistic anomaly caused the coincidental global creation of several cognitohazards that were lethal to the population of P-413 and several other migrant species. This anomaly was traced to a machine in a research facility, presumably investigating probabilistic anomalies. This machine has since been deactivated. P-413 is currently being considered for extraterrestrial development. Blueprints for a Site-413 have been developed, and are pending approval. Details: P-623 is an iron sub-Earth planet. The inhabitants of P-623 appear to have been significantly less scientifically developed than most other planets accessible via SCP-XXXX, save for a secret organization operating in a manner similar to the Foundation. The instance of SCP-XXXX was located in a facility operated by this organization. Records indicate that throughout the organization's history, anomalous threats became more prevalent and more dangerous, eventually resulting in an apocalyptic scenario. Details: The exact details of P-081 are unknown, as exploration has proved impossible via current means. SCP-XXXX exits into a deep underground pit. At the surface, the room containing SCP-XXXX's pit is ornate and covered in holographic patterns. Any matter which touches these holographic walls instantly disintegrates. Entities native to P-081 occasionally appear to observe the interior of the room, before leaving. P-081 was first encountered by Agent Moriet, who was sent in along with a small team to explore several planets accessible by SCP-XXXX after the initial incursion. At this time, the holographic fields surrounding SCP-XXXX were not present, and as soon as the native entities noticed Agent Moriet they quickly executed him using what appeared to be a ritual knife as the rest of the team quickly escaped. The native entities remain distrustful of SCP-XXXX, not allowing anything from SCP-XXXX to leave its chamber. 1. Each glyph is arbitrarily assigned a digit for documentation purposes.